IN A SKY MISTED BY TEARS, A RAY OF LIGHT NOW DESCENDS! THAT SHINING FORM IS THE MESSIAH OF STEEL! THAT OVERFLOWING POWER COMES FROM LOVE AND COURAGE! IT CAN CRUSH ANYTHING, THUNDER!!! A long-running, Massive Multiplayer Crossover video game franchise, based off almost every Humongous Mecha series ever made in Japan. Also known as Super Robot Taisen if you're looking for the US releases (retitled to avoid a trademark conflict with Robot Wars) or just feeling particularly Japanophilic. In western terms, imagine if The Avengers (both teams of that name), the Justice League, Spider-Man, the Scoobies, the Fantastic Four, the X-Men, the Doctor, and The Incredible Hulk teamed up with G.I. Joe, SG-1, Battlestar Galactica (the original and rebooted series), and the crew of the Serenity. Inject them with industrial levels of weapons-grade hot blood. Now imagine the threat it would take to bring them all together, and imagine them pounding it flat. The first Super Robot Wars was released on the Nintendo Game Boy, and featured mecha from Mazinger Z, Gundam (various series) and Getter Robo (who usually appear in subsequent games). As the series grew, more series were added, as well as their characters. Each game would take the storylines of all the series and merge them into one (mostly) complete whole. This often required some creative interpretation, particularly in the case of Gundam, as characters, mecha and events that took place decades apart in the original stories will now occur within a matter of weeks of each other, if not at the same time. The usual setup for your average Super Robot Wars game is pretty simple: take the story of every Humongous Mecha series included, put it in a blender, and set to "liquefy". The player usually sees the story through the eyes of an original character and their mecha. As the story begins to wind down, an additional threat from another planet or dimension makes itself known, and the gathered heroes come together to beat the unholy hell out of them. Of course, the interactions can sometimes have an interesting effect on the various characters. The Super Robot Wars Alpha games, for example, are highly regarded by many fans for making Shinji Ikari much less of a wuss. Starting from the second game, entirely new mecha and characters are introduced. These became known as Banpresto Originals. In 2002, Banpresto released Super Robot Wars Original Generation for the Game Boy Advance, which consisted entirely of the original characters and mecha created for the series over the years; a sequel appeared in 2004. Both are the only Super Robot Wars games to be released in North America, due to the obvious lack of licensing problems. This finally came full circle with the release of a 3-episode OVA set after the second game, and a TV anime Divine Wars, which retells the story of the first game. As of 2011, an anime of the second game entitled The Inspector was released. Compare Another Centurys Episode, the third-person Mecha Game equivalent also made by Banpresto (in cahoots with From Software of Armored Core and Metal Wolf Chaos fame) and SD Gundam G Generation, a similar strategy series centered exclusively around the Gundam franchise. Super Robot Wars: The game that started it all. Released in April 1991 for the Game Boy, contains mecha only and no pilots; essentially has an Excuse Plot and isn't counted in any timeline. Super Robot Wars 2: The first game to have a story and Banpresto Originals. The plot starts with a Civil War with the Divine Crusaders. Released on the Famicom in December 1991. A remake was released for the Game Boy in June 1995, but isn't canon to the timeline. Important Banpresto Original characters debuting here: Masaki Andoh, Shu Shirakawa, Bian Zoldark. Super Robot Wars 3: Sequel to the second game, first one for the Super Famicom. Released in July 1993, it revolves around the attack of the Zuvorg Alliance's Inspectors. Important Banpresto Original characters debuting here: Lune Zoldark, Mekibos, Vigagi, Aguija, Sikalog, Wendolo. Super Robot Wars EX: A sequel, of sorts, to the third game. Released in March 1994, this takes place in Masaki's enigmatic world of La Gias, and deals with the Masou Kishin storyline. Important Banpresto Original characters debuting here: Hwang Yang Long, Tytti Noorbuck, Mio Sasuga. Super Robot Wars 4: The proper sequel to Super Robot Wars 3 and the final story of the Classic Timeline, dealing with the invasion of the Guests from the Zuvorg Alliance. Released in March 1995 on the Super Famicom, players get to choose from some Banpresto Originals, with staple personalities, to be the protagonist. This gets remade a lot of times, from Super Robot Wars 4 Scramble (January 1996; no longer canon) to Super Robot Wars F/F Final (April 1998 for Sega Saturn, later ported to the Sony Playstation; F Final the last being considered canonical). Gilliam Yeager from Hero Senki makes an appearance here, and is also the debut appearance of the Super Robot Genre Mazinkaiser. Important Banpresto Original characters debuting here: Irmgult Kazahara, Ring Mao, Lenonjayce Starlord, Mina Likering, Hector Madison, Patricia Hackman, Arwynn Dorstein, Grace Urigin. Series debuts: Daimos (Only in 4), Dancougar, Aura Battler Dunbine: The Tale of Neo Byston Well (Only in 4), Gundam Sentinel (Only in 4), Heavy Metal L-Gaim, Zambot 3 (Only in 4), Neon Genesis Evangelion (Only in F), Gunbuster (Only in F/F Final), New Mobile Report Gundam Wing: Endless Waltz (Only in F/F Final), Space Runaway Ideon (Only in F/F Final). Super Robot Wars Gaiden: The first SRW Gaiden Game, occurring partway through the Classic Timeline (before Super Robot Wars 2 and after Super Robot Wars 4). This is actually the first Original Generation game, as it only includes Masou Kishin characters. Released in March 1996 on the Super Famicom. Super Robot Wars Alpha: The first SRW to get a rather complex storyline, centered on the Balmar invasion and, to some extent, on the terrestrial Choukijin plot (in actuality, the story is simply an upgraded form of Shin Super Robot Wars). Released in May 2000 on the Sony Playstation, it's the first game to allow pilot customization of skills and statistics and also brings back old characters like Ring Mao, Irmgult Kazahara, Masaki Andoh, Lune Zoldark, Shu Shirakawa and the SRX Team, as well as Ingram Plisken and Viletta Vadim from Super Hero Sakusen. A Video Game Remake was released on the Sega Dreamcast in 2001, featuring 3D visuals, increased difficulty, secret boss characters and a cameo of the G-Breaker, a robot from Bandai's Sunrise Eiyuutan. Series Debuts: The End Of Evangelion, Mobile Suit Gundam F90, Super Dimension Fortress Macross (Includes the original TV series and movie Do You Remember Love? ), Macross Plus. Super Robot Wars Alpha Gaiden: A Gaiden Game of the Alpha series involving Time Travel to an apocalyptic future and the battle against the Ancestors/Machinery Children; remains a fan favorite. Released in March 2001 on the PlayStation, it's the first game to incorporate the Support Attack/Defend system and it also brings back Masou Kishin characters for their final appearance before the Original Generation sub-series, which was a source of Urban Legend of Zelda speculation that Banpresto got sued by Winkysoft for using their characters (Word of God states the team really just wanted a break from the recent spate of Masou Kishin-centric stories). Also features the first theme song in the series, performed by JAM Project, "Hagane no Messiah". Series debuts: After War Gundam X, Turn a Gundam, Combat Mecha Xabungle, Galactic Whirlwind Braiger. Super Robot Wars Alpha 2: Proper sequel to Alpha, released on the Sony Playstation 2 in March 2003. First title to introduce squad-based mechanics and revolves around the Sealing War against the Gun Eden. Also marks the promotion of Sanger Zonvolt, formerly The Dragon in Alpha Gaiden, into a protagonist, and confirmation the canon heroes of the Alpha games are Kusuha Mizuha and Brooklyn Luckfield. Important Banpresto Original characters debuting here: Arado Balanga, Seolla Schweizer, Ibis Douglas, Sleigh Presty, Tsugumi Takakura, Ratsel Feinschmeker (despite him being Elzam V. Branstein, it's this persona debut, as a result of Canon Immigrant), Kukuru, Irui Gun Eden. Series debuts: Brain Powerd, Mobile Suit Crossbone Gundam, King of Braves GaoGaiGar, Kotetsu Jeeg. Super Robot Wars Alpha 3: The most crowded SRW at its time (33 individual series!). Released in August 2005 on the Playstation 2, this is the sequel to Alpha 2, ending the Balmar War saga. It's also famous for introducing Sega's Virtual On characters, the first time another company's video game series was brought into the franchise. The SRX Team, who were absent in Alpha 2 sans Viletta, make a full blown return, as do all of the previous game's originals. Series Debuts: Virtual On (Includes Oratorio Tangram and MARZ), King Of Braves GaoGaiGar FINAL, Mobile Suit Gundam SEED. Super Robot Wars Compact: First SRW for the Wonder Swan released in April 1999. Features the Stage Select system, but is devoid of originals. In December 2001, it gets an updated port to Wonderswan Color using...well, colors. Super Robot Wars Compact 2/Impact: This SRW has such a huge storyline, it was separated into 3 games for the Wonderswan altogether. Released between March 2000 to January 2001, it revolves around the Einst invasion. In March 2002, it gets compiled into Impact for the Playstation 2. Super Robot Wars Compact 3: Released in July 2003 for the Wonder Swan Color, the last Compact story deals with the Shura invasion. Super Robot Wars MX: Taking a jump to the Playstation 2 for good, this game was released in May 2004, and one year later in December 2005, gets ported to the PlayStation Portable. Introduces the Favorite Series system and deals with the artificially intelligent Medius Locus/A1 saga. Originally intended to be Impact's sequel, due to similar entries that game, but scrapped the idea. Super Robot Wars Z: Made for the Playstation 2 in 2008 and the start of a new series, with the largest debut of new series in a single SRW. Incoporating the Tri-Battle System, the story revolves around the "Holy War", alongside the Chimera and the ever enigmatic "Evil Masaki", Asakim Dowin. Series Debuts: Super Dimension Century Orguss, Chojushin Gravion (Includes Gravion Zwei), Genesis of Aquarion, Psalms of Planets Eureka Seven, Overman King Gainer, Baldios, Space Emperor God Sigma, The Big O (Season two). The 2nd Super Robot Wars Z: Hakai-hen (World Breaking Chapter): Part one of the sequel to Z, it will retain almost all of the original cast listing, alongside a surprising number of series additions and returns. This game was intended to celebrate the franchise's 20th anniversary. Released on April 14, 2011 for the PlayStation Portable. The 2nd Super Robot Wars Z: Saisei-hen (Reborn World Chapter): Part two of The 2nd Super Robot Wars Z. Released on April 5, 2012 for the PlayStation Portable, Saisei-hen has broken the record set by Alpha 3 with the largest number of individual series in a single game. Super Robot Wars Advance: First game for the Game Boy Advance released in September 2001. First game to incorporate Combination Attacks and deals with the invasion of the Shadow-Mirror. Original robots are picked up/upgraded from Super Robot Wars 64. Gets an Updated Rerelease for the PlayStation Portable that's extremely shiny but also Nintendo Hard in 2008. Super Robot Wars Reversal: Second Game Boy Advance title released in August 2002. Revolves around Time Travel and the mysterious interloper Duminuss. Super Robot Wars Destiny: Third SRW for the Game Boy Advance, released in August 2003. Introduces the Chain Attack system, but horribly implemented armor coding nerfs super robots in general. Deals with the Ruina and the Sealing of the Earth (non-related to Alpha 2's Sealing War). Series Debuts: The Big O (Season one), Daltanius, Getter Robo Armageddon, Macross 7, Megazone 23. Super Robot Wars Judgment: The final SRW for the Game Boy Advance in September 2005. A bit notorious for the lack of Universal Century Gundam and Getter Robo entries, and the inclusion of Powered Armor-using series'. Deals with the Lunar Fury invasion. Series debuts: Full Metal Panic! (Includes the first-half of the original TV series and Fumoffu? ), Mazinkaiser VS the Great General of Darkness, Tekkaman Blade. Super Robot Wars W: Debut SRW for the Nintendo DS in March 2007. Brings back Getter Robo, but still no Universal Century Gundam (or any shows directed by Yoshiyuki Tomino, in general). Deals with the mechanical Database. Notably the first SRW to have a cast list made exclusively of shows licensed in the United States (save perhaps the particular version of Shin Getter the game uses, although Getter Robo Armageddon was released in the States and the cast here is classic Getter G, e.g. the group that got dubbed into "Starvengers") with at least one franchise (GoLion/Voltron) being incredibly obscure in Japan and seemingly only really included to appeal to Americans. Despite this, the game has not come out in North America. Super Robot Wars K: Released for the DS in 2009. Uses an interface similar to W's with a brand-new Partner Battle System. The cast is even more notorious than Judgment, by having no Universal Century Gundam, no Getter Robo, and even no Great Mazinger!. Super Robot Wars L: Bringing back many familiar series from K, L seems to fix the Partner Battle System. Unfortunately, those who wish for Universal Century Gundam and Getter Robo will be disappointed again; however, Great Mazinger is back in. Released on November 25, 2010 for the DS. Super Robot Wars UX: An SRW title for the Nintendo 3DS, and the first Nintendo handheld game to feature voice acting. Has a lineup that has no Universal Century Gundam, no version of Getter Robo, and the only Mazinkaiser entry is Mazinkaiser SKL, so this would make this the first game to not even have any form of Kouji Kabuto. It is also the first game for a Nintendo handheld SRW to use DLC addon content. Super Robot Wars Operation Extend (OE): A PSP title, and the first to be almost completely digitally released in the form of DLC. It has 8 chapters of about 20 stages each (not counting DLC/mission pack extras) and uses the SRW NEO game engine, albeit in reduced format with some modifications for the casts included and the PSP handheld format. It has over 30 different series, with the intent of using as many as possible. It is also one of the few SRW handheld games to feature SRW Alpha like squad systems. Super Robot Wars Scramble Commander: Released in November 2003 for the Playstation2, it's actually a Real Time Strategy game. Devoid of originals, but does have the Swordian Guards, which reappear in Original Generation Gaiden. Super Robot Wars Scramble Commander 2: The second Scramble Commander released in November 2007 for the Playstation 2. Shin Super Robot Wars: Released in December 1996 for the Sony Playstation, it marks the debut of the SRX Team and Balmarians, both of which got a comprehensive retooling when Super Robot Wars Alpha was released. Super Robot Wars 64: Released in October 1999, this is the only entry for the Nintendo 64. Notorious for having loads and loads of stages, a rather complex branching system, and many original mecha the Shadow-Mirror would base theirs off of (or outright use). Original characters and mecha confirmed by Word of God not to appear in Original Generation. Super Robot Wars GC: The only SRW for the Nintendo GameCube, released in December 2004. Done in full 3D and uses a unique parts system that determines where damage is dealt to a machine (head, torso, limbs). Gets ported to the Xbox360 as Super Robot Wars XO in November 2006, which adds a turn-based online multiplayer mode. Super Robot Wars NEO: First SRW for the Wii. Released in October 2009, it utilizes the same 3D scheme from GC/XO and eschews a grid-based movement system for a radial-based one, a first for the franchise. This is also the first SRW to be totally devoid of real robots (G Gundam is the Gundam representative, and even then, you only get the God Gundam). Super Robot Wars Original Generation: First proper Original Generation game released on the Game Boy Advance in November 2002. Features original characters only and mixes the first part of the Balmar War and Divine Crusaders War, alongside never-before-seen originals. Also the first one to touch "The School" subplot hinted in Alpha 2, which later mingles with other originals and introduces a unique interchangeable weapon system. Since it's devoid of licensing problems, it's the first to be localized into English. Super Robot Wars Original Generation 2: Sequel to the first Original Generation, released in February 2005 on the Game Boy Advance and got localized, too. Continues the story and adds up the Inspectors, Shadow-Mirror, Einst and Machinery Children. Super Robot Wars OG: Original Generations: Video Game Remake compiling the two Original Generation Game Boy Advance titles for the Playstation2 in June 2007. Presumably due to cost considerations, this game has yet to be localized. Adds up the Twin Battle System and retouches the story with minor and major alterations, including the addition of the originals from Reversal; effectively, the game essentially Retcons the first two Original Generation games (as well as the first 3-episode OVA) via Continuity Reboot. The game was intended to celebrate the franchise's 15th anniversary. Super Robot Wars Original Generation Gaiden: Gaiden Game sequel to Original Generations, released in December 2007. Rather short compared to other entries in the series, but features lots of bonus material like a trading card mini-game and a battle viewer. Story-wise, it continues from Original Generations and adds the ODE Incident from the OVA/drama CD, Duminuss, the Shura, and a revamped Einst (now called Jetzt), as well as the heroes and villians from one of Banpresto's early crossover franchises, Great Battle. Also features cameos from Touma Kanou of Alpha 3 and the originals from MX. 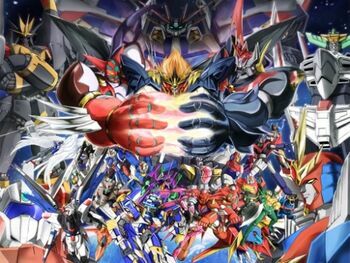 The Second Super Robot Wars Original Generation: Sequel to Original Generation Gaiden, this will be the first Super Robot Wars to be released on the Play Station 3. The story will include Kusuha and Ibis' from Alpha 2 and follow up on Hugo and Aqua's MX story introduced in OG Gaiden. New series entrants will include Joshua Radcliffe and Cliana Rimskaya from Destiny, Ariel Org and Duvan Org from the obscure Real Robot Regiment and Ing Egret, the last of the Machinery Children who first appeared in Lost Children, a manga side-story from Alpha 2. Release date is currently set for a winter 2012 release. Super Robot Wars OG Saga: Endless Frontier: First spinoff game under the title "OG Saga". Basically a multiverse-travelling Eastern RPG. Released for the DS in May 2008. Features a cast referencing previous SRWs and crosses over with Namco X Capcom and Xenosaga, showcasing Reiji Arisu, Xiaomu and KOS-MOS. Released in the US in April 2009, making it Reiji and Xiaomu's international debut. Super Robot Wars OG Saga: Endless Frontier EXCEED: DS sequel to Endless Frontier released in February 2010. All playable characters from the previous game return alongside new protagonists. Ties into the events of Original Generation Gaiden, as Axel Almer, Einst Alfimi and Fighter Roar make their way to the Endless Frontier as playable characters, including MOMO of Xenosaga. Mark Hunter from Gaia Saver makes a cameo. Super Robot Wars OG Saga: Masou Kishin - The Lord of Elemental: An Updated Rerelease of Super Robot Wars Gaiden for the DS in May 2010. The intent is to incorporate and expand on the untold Masou Kishin story and characters into Original Generation Continuity. Super Robot Wars OG Saga: Masou Kishin - Revelation of Evil God: Set for a January 12, 2012 release, this will be a PlayStation Portable sequel to The Lord of Elemental and marks the 15th anniversary of the Masou Kishin series. Revelation of Evil God will come bundled with the The Lord of Elemental DS rerelease, complete with enhanced visuals and extended voice acting. Hero Senki: Project Olympus: An Action RPG for the Super Famicom that features Toku heroes Kamen Rider and Ultraman, as well as several Gundam pilots in Powered Armor stylized to their Gundams. Gaia Saver: Another Action RPG for the Super Famicom similar to Hero Senki. The Great Battle (1-6): An Action Game series mostly appearing on the Super Famicom, featuring Super-Deformed heroes such as Ultraman, Kamen Rider, various Gundams and the original Henshin Hero Fighter Roar. The series also spawn many spin-offs to various genres, such as Battle Pinball, Battle Racer, Battle Dodgeball and so on. Although these games seem to be free of plot, the fact Kouta Azuma uses a hoverboard, similar to the one used by Roar in Battle Racer and in the Endless Frontier EXCEED drama CD might tell us something. Super Robot School: A High School AU simulation spin-off based on the titles and sprites featured in Judgment, W and K, but replacing Tekkaman Blade with Getter Robo Armageddon (which is really W's Shin Getter with pilot portraits from Destiny). The Original Generation version of Compatible Kaiser also appears. One of the saving graces are Moe characters designed by Eiji Komatsu (of the Deep-Blue series and Maburaho). Apparently based on a desire to expand the concept behind Link Battler and the XO multiplayer modes. Released for the DS in fall 2009. Shin Masou Kishin: Panzer Warfare: Released around the same time alongside the Cybuster Animated Adaptation, it uses similar mecha designs for the Elemental Lords. Supposedly takes place in the far future when the civilization of La Gias has long since been forgotten, but the game's generally ignored by fans since it's somewhat disappointing. Although it brims with material for WMG, Banpresto never touched Panzer Warfare again...until the release of Super Robot Wars Z, where this version of the Cybuster can be seen in the Shurouga's Ley Buster attack animation. Super Robot Wars Original Generation The Animation: A 3-episode OVA set after Original Generation 2. The story's about the next generation of unmanned mecha from The Federation inexplicably going berserk and kidnapping people as part of an Assimilation Plot, including several of the main characters. The OVA's story would be re-adapted into a set of bonus missions in Original Generations called "2.5: Unified Wisdom"; the story is fully fleshed out in Original Generation Gaiden. Super Robot Wars Original Genration: Divine Wars: A 26-episode TV adaptation of the first Original Generation game that re-tells Ryusei Date's story. Super Robot War Original Generation: The Inspector: TV adaptation of Original Generation 2 and sequel to Divine Wars. Series now airing on Crunchyroll. Arms and Armor Theme Naming: The series features several characters named for brands of guns, including Kyosuke Nanbu, Excellen Browning, Ingram Plisken and his clone Viletta (presumably supposed to be Beretta) Badim. Ingram's most famous Humongous Mecha, the Astranagant, is another example (Astra + Nagant). It helps the buggy theme in question is freaking awesome. ...which would lead to the inevitable when Macross Frontier makes it onto the games. Ninjiin loves you yeah! Lunamaria Hawke's aiming ability due to her missing a battleship with a beam rifle in Gundam SEED Destiny is translated into "awful range and hit skill combined with the Strike Spirit Command costing 30 SP". The only other character to match this level of exaggeration is Masaki Andoh. Luckily, Banpresto compensated by giving her a good melee stat. To say nothing about the parts you can equip on machines, such as the Tem Ray Circuit, based off an item that Amuro's father made in the original Mobile Suit Gundam that is nothing more than a piece of junk. It has its uses, however. Eviler Than Thou: Einst towards Inspectos and Shadow Mirror in Inspector anime - their attacks forced them and heroes into Enemy Mine situation at one point. They even took over Wendelo. Evil vs. Evil: When two enemy fractions meet with you at the battlefield, one will be "primary enemy" and other "secondary enemy". They can ocassionally go against each other's throats. Sometimes done story-wise, most notably being W, where you have Zonderians from GaoGaiGar fighting Radam from Tekkaman Blade, The Radam fighting The Evolouders from Detonator Orgun and The Evolouders fighting Eleven Lords Of Sol from GaoGaiGar FINAL. Some of the main female cast is notably absent: Carla, Lune, Lefina, Lemon, Alfimi, and fan favorite Pettanko Ibis. Ibis and Carla were added beginning with episode 15; as a joke (or a likely homage to a particular meme involving "riding"), Sanger and Ratsel were in. Five-Man Band: The ATX Team. In Original Generations, Lemon Browning reminds Axel Almer that Beowulf isn't the only person with the "wolf" monniker. In the sequel Original Generation Gaiden, the Cry Wolves from Super Robot Wars MX show up. In Original Generation 2, Lamia mentions a number of Shadow-Mirror units were lost in transit when they jumped before the main group. In Original Generation Gaiden, Axel makes references to Shadow-Mirror's "Project EF"—as in, Endless Frontier, where some of those lost units ended up. In the DS remake of Super Robot Wars Gaiden, Masaki gets so lost his friends aren't really sure where he is anymore. Three months later after the remake is released, he finally turns up...in Another Century's Episode: R.
Hot-Blooded: Never in history has such an pure concentration of hot-blooded heroism ever been assembled. Handle the games with care, your game system might spontaneously combust from the sheer awesomeness of it. Hopeless Boss Fight: Done many times in cases where the script of the series being played out means the heroes must lose, even though it might still be possible for the palyer to win in gameplay terms. Famously, this is the only way to stop Elzam V. Branstein from Trombe!ing through any and all background music. It's also a nice way to level up characters you've been neglecting and suddenly decide to use: just take the route they're not available in. When they rejoin, their levels will increase relative to how long they've been away, usually enough to match your own. No Experience Points for Medic: Until Super Robot Wars Gaiden. It got toned down somewhat with Z...somewhat. You still get stuff like the Final Dynamic Special, with 4 Super Robots ganging up on one enemy group using almost everything in their respective arsenals. Not to mention the Nu Gundam. Fans joke the entire animation budget was used on it. this got one uped in SRWMX one could double team attack the foe with the Shuffle alliance and the Final Dynamic special both team attacks for one long (a little over 2 minutes) needless to say just about everything not a full health boss is almost certainty dead after taking 2 finishing team move combos. Upped again in SRW Original Generations, where one could do a double team attack, followed by a second double team attack on Suppourt Attack. Shown here with R-Formation/Tatsumaki Zankantou to Twin Bird Strike/Royal Heart Breaker. Red and Black and Evil All Over: As part of being a Char Clone, Elzam paints his robots black with red bits (Along other tweaks). He eventually gets his own robot, the Aussenseiter, which is also in this costume. He eventually does a Heel Face Turn, though. Second-Person Attack: Quite a few attacks do this, probably so the animations can play fine regardless of how the target looks. A good example would be Mazinkaiser's Final Kaiser Blade. In addition, the visual style serves to minimize weirdness from units of massively different size interacting. The most notable character out of this trope should be Kabuto Kouji, who appears in EVERY single series to date. Which makes sense due to the fact that Kouji is the FIRST mech pilot. Removing him would be like removing your ancestor out of the family tree. But partially subverted because even the most hated villains may live (if it's a sequel series), due to the Fix Fic nature of the games, thus characters who're supposed to die will live, with the added bonus of certain villains performing a Heel Face Turn and joining the crew. Brooding Boy, Gentle Girl: Kyosuke Nanbu and Excellen Browning. Excellen is not gentle per se(she's more genki), but Kyosuke is DEFINITELY brooding, and Excellen is very sweet and loving with him. Sikalog does this, too; the weapon he uses is an actual flail. Compatible Kaiser's updated appearance in Original Generation is almost a complete clone of Gravion (granted, it's the same mechanical designer Masami Obari). Notably the Gespenst MK II Type-S is a Hot Blood-inducing machine. GESPENSTO KIIIIIIIIIIIIIIIIIIIIIIICKU! Not only does the Gunleon carry a giant spanner and throw a smaller one for one of its attacks, it has spanner-nunchucks - and gets a lightning-effect pose when used. And who in the right mind would pilot a heavy armor-riddled machine that can barely move with a pile bunker and titanium ball bearing launchers?? Zonders finished by GaoGaiGar's Hell and Heaven explode just as they did in the series, and it doesn't matter who you are if you get hit by the Goldion Hammer: you're turning into photons. Or Powered by a Forsaken Child, at least until Lamia was captured and was reduced to Mecha-Mooks. Friendship: Restore all allies' hit points. Love: Perfect hit/dodge, 2 x damage/money/experience and +3 movement for one attack. Generally given to especially awesome Real Robot pilots. Courage (the Super Robot version): One-turn perfect hit, near-invincibility, 2 x damage, barrier-piercing, +3 movement and +10 Will. Guess Hope should be included: 2 x money and experience, full hit point restoration and +10 Will. The whole premise of the series is this. Spared by the Adaptation: Many, many characters. It's taken to Fix Fic levels in Reversal, preventing the downer endings of some shows, the fictional downer endings of events that are supposed to come to a good end, and averting Chars Counterattack and Prince of Darkness. But is still above the badass level of Rebuild Shinji. This page was last edited on 17 July 2018, at 02:09.